Garden patio ideas can be found everywhere. Be inspired this spring with four of ours. Patios are a wonderful way of providing extra space for entertaining, dining, or relaxing. With a bit of forethought and some inspiring garden patio designs you can create a beautiful, outdoor patio that’s practical and allows you to enjoy your garden all year round. The right patio designs can add variety, style, and function to any garden space, but with so many great patio ideas to consider it may be hard to know where to start. By keeping a few basic points in mind you can still create something simple yet effective. Your patio doesn’t have to be immediately next to the house. It can easily be linked with a footpath or stepping stones for easy access and continuity of design. The spot that gets the best sun or protection from the wind could be further down the garden. Will you be using it for dining in the evening or having breakfast, and do you want to be in the sun on these occasions? Kits are most cost-effective than bespoke patio designs and still look stunning. Rectangular garden patio designs are popular in linear gardens as they make the best use of the available space and they can be softened at the edges with suitable plantings. 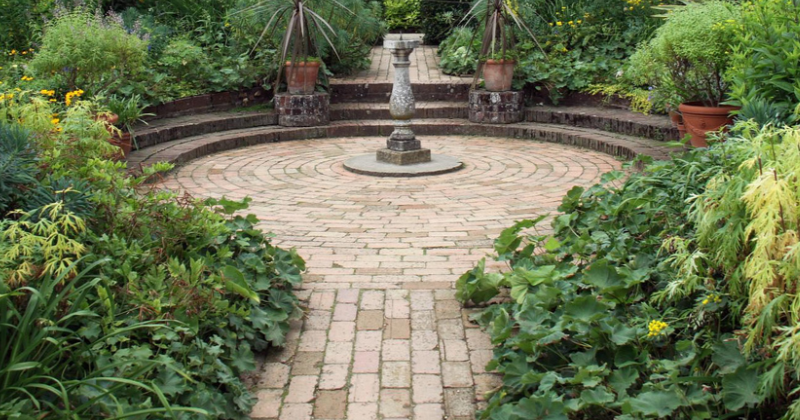 If your garden is an irregular shape, you might consider circular or rounded patio kits. If you’re going for a more minimalist feel, there are plenty of sharp, modern kits to choose from that will complement your particular patio design. Browse our range of beautiful patio feature kits. For outdoor patio ideas, consider garden furniture. The right furniture can turn your patio into an outdoor room connecting your garden to your home. Rattan furniture or wooden benches with soft furnishings lend an exotic touch to a rustic, cottage garden. Wrought iron furniture is also a good way of adding an ornate yet traditional look. With such varied weather all year round, it’s well worth considering umbrellas and awnings. These provide shade on hot, sunny days and cover when more typical British weather resumes. Minster Tip: Whatever your preference, your garden furniture needs to be able to withstand inevitable rain. You have two choices: quality pieces, expertly sealed and finished, or lighter ones that you can store during the winter. 4. Have you considered the details? Beauty lies in the details. For an atmospheric garden effect, we recommend fairy lights, lanterns, or candles. For reading, dining, and entertaining, wall lights or post-mounted ground lights would be better. These can still be softened with some recessed ground lights. Whichever garden patio ideas you prefer, the right paving stones are essential. Yorkstone Riven is popular for traditional gardens as its texture and uneven edges provide a satisfyingly natural look and feel. Worn Limestone or Travertine slabs vary in finish and colour, which adds shade and subtlety to the patio. You can find out all about the beautiful stones we work with in our complimentary brochure. With so much choice, patio ideas can be hard to decide, but find the perfect one and you can find yourself with a breathtaking feature. Extremely durable and available in a variety of materials, colours and textures, your choice of paving slab enables you to create a patio space unique to your garden. We’ve handpicked some patio articles and content perfect for you. Find out everything you need to know about planning and creating your patio.